Do you want to feed a Red Panda? Maybe hold one in your arms or at least want to pet one? Of course, Red Pandas aren’t pets and they aren’t some “cuddly toys”. But some zoos offer close encounters with them – with some important rules in mind. The Paradise Park in Hayle offers a Red Panda Experience for £150. This price includes a donation to the Red Panda Network. For this 30 minutes long experience you have to be over the age of 10 years, children between 10 to 15 years must be accompanied by a parent/guardian. A so called Red Panda VIP Experience gets you closer to the Red Pandas of Longleat Safari Park near the city of Warminster. The encounter takes place at the Monkey Temple and with the VIP voucher you also get a One Day Ticket for the zoo. Children between 8 to 15 must be accompanied by an adult. The Red Panda VIP Experience is currently sold out. We will post an update when it is available again! 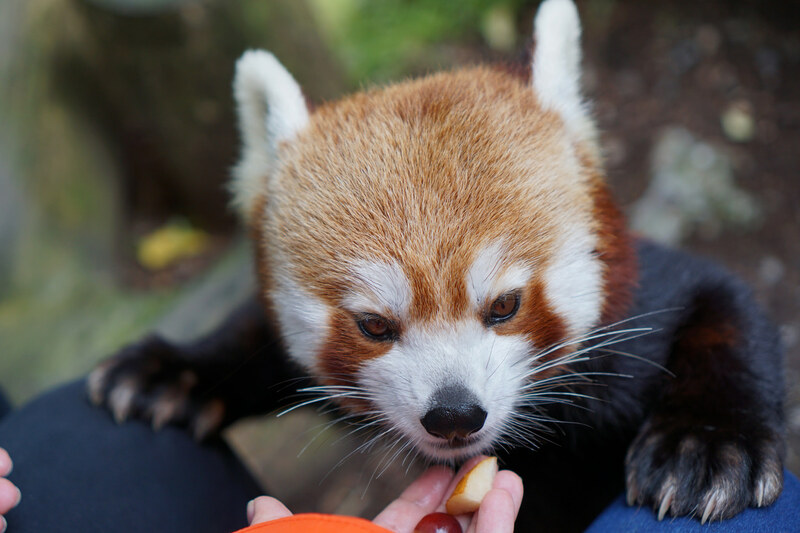 The Bristol Zoo Gardens in South West England provide regular Meet & Greets with Red Pandas on every Tuesday and Friday at 11:00 and on every Thursday at 10:00. There is a maximum of two visitors allowed and the Meet & Greet is only available for all over the age of 6. Children between 10 to 15 years must be accompanied by an adult. Prices are £65 for one person or £95 for two people (inc. VAT). At Shepreth Wildlife Park Red Pandas can be visited and fed daily from 11. 30am – 12pm. Visitors must be over 16 years of age. £5 of the entrance fee goes to the Shepreth Wildlife Conservation Charity. At the end you will get a certificate of participation. Prices: £100 for one person and £50 each per adult (max. two persons). There was a Red Panda Behind the Scenes program at Calgary Zoo in Canada but due to the “redesign of the public and private animal experiences” it is currently not available. Another possibility to get closer to the Red Pandas is the Zookeeper for a Day-program with the Eurasia option. This is available only on some special dates for max. 2 people with the age of 14+ and includes assisting the zookeepers with duties for Red Pandas but also for snow leopards and tigers. Prices: Full day (7 a.m. – 3 p.m.) $375 per person, half day (7 a.m. – 11 a.m.) $275 per person. Every day is Red Panda day at Wellington Zoo in New Zealand. The daily Red Panda Close Encounter starts at 11:30 am and costs $99 per person – including free zoo entry. It is available for 2 to 4 people and lasts 30 minutes. 10% of the proceeds goes to the Wellington Zoo Conservation Funds. Children between 6 to 14 years will need to be accompanied by a paying and participating adult. At Australia Zoo you can also enjoy a daily Red Panda encounter. They run from 8:30-8:50 am and cost $79.00 per person (does not include admission). Minimum age is 6 years, children aged 6 to 14 must be accompanied by a paying, participating adult. A maximum of 4 participants can join the Red Panda encounter. At the Red Panda experience you will meet Symbio Wildlife Park’s „happiest residents“ (according to the zoo’s website). Together with the keeper you can feed and pat the Red Pandas. The zoo also offers a photo package in which the keeper captures the whole experience. The Red Panda experience is daily available at 9.30 am, minimum age is 8 years and up to 2 people can join the encounter. Price: $95.00 per person (plus admission fee). Red Pandazine will update this list regulary. Do you know any zoos where you can meet Red Pandas? Then let us know! We are looking forward to your comments or your emails. Thanks!